At the Fence: Therafit Review and Giveaway! How is everyone today? We are doing great! It has actually been cooling off a lot here recently, and it has even been a little chilly in the mornings! Recently I received a pair of Deborah Women's Sneaker (Black/Pink) from Therafit! LOVE the colors! When my package arrived I opened it, and to my pleasant surprise the box the shoes were in was gift wrapped and tied with a bow! I LOVE my new Therafit sneakers... They are sooooooo comfortable, and look great! Here is a picture of the Shoe Technology, and then I will share a short video on how the Personal Comfort Adapter System works. Doesn't that look great! You can feel confident when purchasing these shoes, knowing that they have so many layers of cushioning that they can't NOT be comfortable! 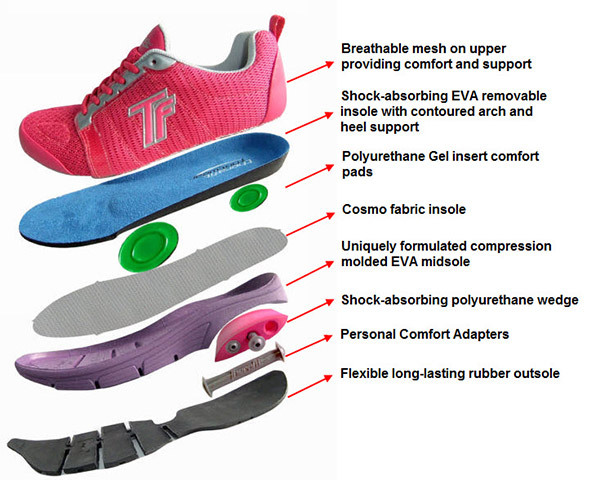 The Personal Comfort Adapters are so that you can "personalize the amount of shock absorbed by your feet. While inserting one, two or all three adapters you can set your comfort level to fit your needs and give you the support you want." The first day I wore my new sneakers (to Racquetball and running some errands) I actually took out all three adapters on one shoe, and left all three in the other, so that I could feel the difference! After wearing them several days I decided that I prefer two or three adapters in. It is so nice to be able to adjust them to your comfort. I really like these sneakers, and I now have a couple of family members that are wanting a pair of shoes from Therafit! Therafit can really help with your Back to School Shopping! They have athletic shoes, sandals, etc. Perfect for a day at the beach, exercising at the gym, walking/running, any athletic sports, gifts, etc. Make sure you go check out the Therafit website! Okay, Therafit is going to send one of my Neighbors Winner's Choice of Renee or Deborah Shoes!! I received no monetary compensation for the review and giveaway. I did receive product for review purposes only. All thoughts and opinions are mine. Writing in red is taken from the company's website/email. My favorite are the Alexa Women's Sneaker Ocean Blue/Yellow!! I like the Tiffany Black Sandal best. I like the Alexa Women's Sneaker Black/Citrus Green. I like their Renee Women's Walking Shoe in White. These look really comfy. Thanks for the chance! I like Alexa Women's Sneaker White/Flamingo Pink. I like the Deborah Women's Sneaker Black/White shoe the best! Thanks! I love the Deborah Women's Sneaker Silver/Blue - thank you. I really like the Renee Women's Walking Shoe White. I like the renee womans walking shoe in white. I like the Deborah is either the pink or the black and pink. I like the Alexa Women's Sneaker Ocean Blue/Yellow. Thanks! I love the: RENEE WOMEN'S WALKING SHOE WHITE. I need a pair like this, and these look great! I love the Renee womens walking shoe in black! My favorite Therafit sandal is the Carly Brown, and my favorite shoe is the Deborah sneaker in red. Love their shoes! I love the Deborah Women's Sneaker Pink. Tank you so much for the wonderful giveaway! I like the Alexa Women's Sneaker Ocean Blue/Yellow. Renee Women's Walking Shoe Black. Deborah in Pink! My back would appreciate them!! My favorite is the Deborah Women's Sneaker in Black/White! So cute! I love the Deborah in pink. http://www.therafitshoe.com/products/123-deborah-blackwhite-athletic-womens-sneaker.aspx These for me, please! I love the Deborah Red! Way cool! I like the Deborah Women's Sneaker in Black/White.